Cambridge, Massachusetts, the year 2028: You emerge from the Kendall/MIT train station, pausing to orient yourself. Your first impressions are of the interplay of brick and glass, and a pulse of activity. The kid next to you tugs her father’s arm. “There’s the museum! Can we go build robots again?” she begs. “I’m just swinging by home between classes,” a passing man says into his phone as he halts to make way for a buggy full of toddlers from the nearby daycare. A group of teens and parents follows a purple-haired young woman who makes walking backwards look easy, as she narrates: “I first started working on my company at MIT’s Innovation and Entrepreneurship Hub, next to where we began our tour, but after I graduate this spring we’re moving down the road into lab space we’ll be sharing with some other startups.” You notice a small crowd in the plaza across the street gathering around what appears to be a musical sculpture. It’s lunchtime, with workers spilling out of nearby buildings, and the café over there still has a few open tables on its patio, but you decide to get a sandwich to go so you can keep exploring. 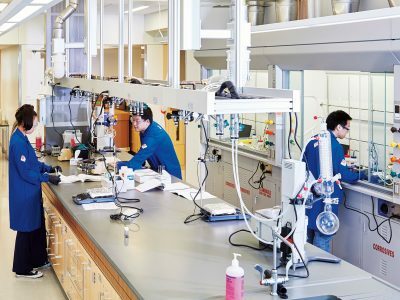 There’s no mistaking this place for anywhere else: You are in Kendall Square—and you are at MIT. 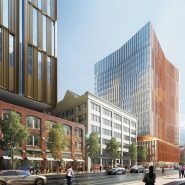 If you visit Kendall now, in 2018, you’ll see signs of a different kind of activity: towering cranes, scaffolding, construction crews who are building the foundations of that future scene. Over the course of the 20th century, while MIT grew outward from its original Main Group buildings along Massachusetts Avenue, nearby Kendall Square boomeranged from an industrial powerhouse churning out candy, soap, and rubber; to relative abandonment; to a burgeoning tech hotspot. 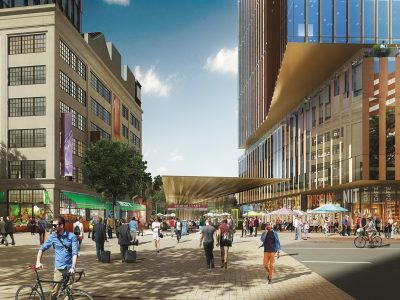 Now, MIT has broken ground on a new chapter for Kendall Square that will transform it into a true portal to and from MIT. 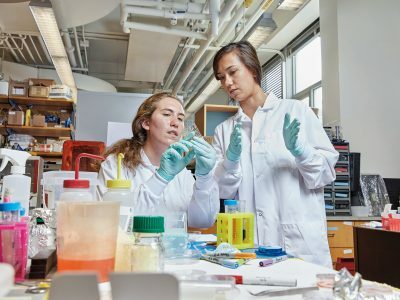 MIT already has a strong biomedical research presence on its eastern threshold at the Koch Institute for Integrative Cancer Research and the Brain and Cognitive Sciences complex, and through affiliations with the Broad, Ragon, and Whitehead institutes. The MIT Sloan School of Management, Computer Science and Artificial Intelligence Laboratory, and MIT Media Lab are among the destinations within a short walk from the Red Line “T” stop. 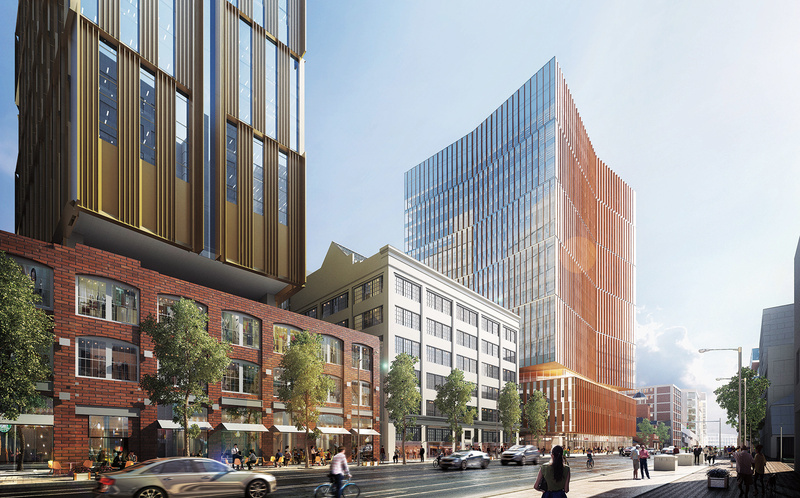 Now, the Kendall Square Initiative will more tightly weave together these elements with new construction including a graduate student residence and childcare center and new homes for the Office of Admissions, MIT Museum, and Innovation Initiative. 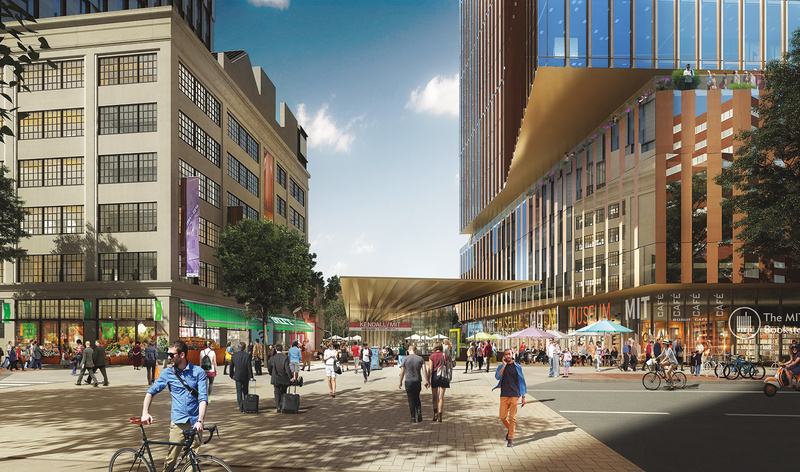 The plan, seven years in the making, adds lab and housing capacity to the area; incorporates flexible indoor and outdoor gathering spaces, new pockets for retail, and underground parking; and allows for easy passage between the square and the Charles River. 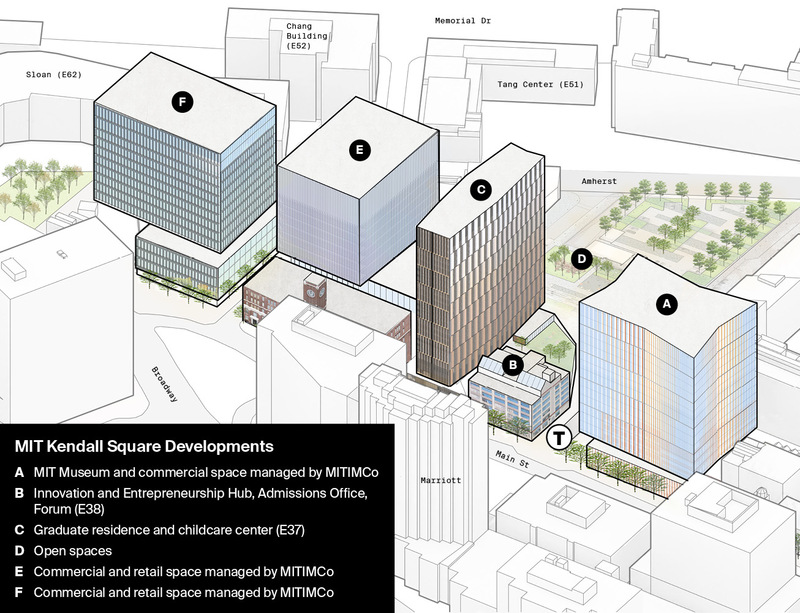 MIT has broken ground on a new chapter for Kendall Square that will transform it into a true portal to and from MIT. 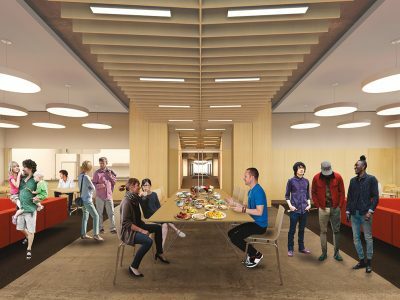 Programming in the new open spaces will showcase MIT’s strengths, ranging from science and technology to the performing arts, as well as introducing the MIT community to the inspiring activity beyond its doorstep. What about those not already in the fabric of the innovation ecosystem? Gallop says that since the KSA’s 2009 founding, the Kendall community has increasingly turned its attention to issues of workforce development, aiming to spread the benefits of Kendall’s growth among its neighbors. 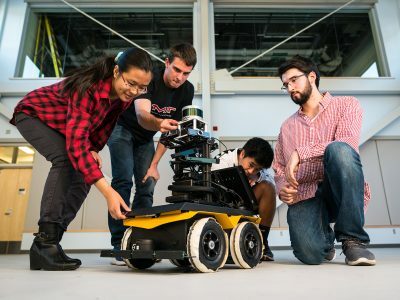 Two job training centers, which will assist Cambridge residents in identifying and developing skills useful in the innovation economy, are set to open in the area next year, one to be created by MIT and another through a collaboration among several local organizations. When the MIT Museum moves into its new Main Street home in 2021, Cambridge residents will enjoy another perk: free admission year-round. John Durant, the Mark R. Epstein (Class of 1963) Director of the MIT Museum, describes this new policy as good citizenship. “We are part of the Cambridge community. And we would like to make what MIT represents as meaningful and as relevant to our immediate neighbors as we can.” To encourage repeat visits, the museum has already increased turnover of special exhibitions and programming related to content in the galleries. For example, this fall, an exhibition about MIT nautical engineer Nathanael Greene Herreshoff 1870 is accompanied by a workshop on boat design, complete with the opportunity to 3-D print a hull. But current facilities can’t fully meet the demand for such experiences. In addition to larger galleries, Durant looks forward to tripling the museum’s programmatic square footage, including a larger public makerspace called the Idea Hub. He’s also eager for the day that the annual Cambridge Science Festival, spearheaded by the MIT Museum, can finally be hosted on its own indoor and outdoor premises. The architect’s representation of the new plaza accompanying this article shows small flowering trees. 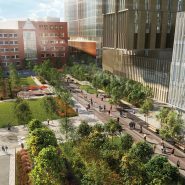 I’m really hoping MIT is planning to include trees in this plaza that can grow to have large, expansive canopies and large healthy root systems. Big shade trees play a vital role in maintaining the ecological and infrastructural health of a city. They play a major role in stormwater management, absorbing thousands of gallons of rainwater. They provide habitat for a wide variety of living creatures. Their shade and transpiration can reduce urban ambient air temperature by as much as 10 degrees F, and can reduce the temperature of pavement by as much as 25 degrees F.
Not least, healthy trees play a significant role in supporting urban human psychological well-being. All this is documented in published urban forestry research. It makes huge sense to include planning for substantial, long-lived shade trees in urban planning. 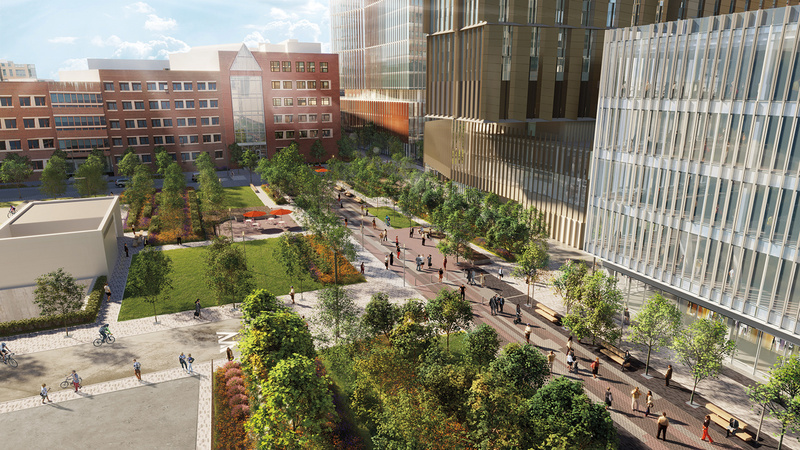 Is MIT including planning for healthy, long-lived shade trees in this project? Unfortunately, this is the kind of trees we seem to find around in modern settings. Maybe MIT should be trying to create a Killian Court like feeling of trees. Not to say, that all these new buildings and innovation is not good, but good old trees are better. What a vigor project ever seen in life! 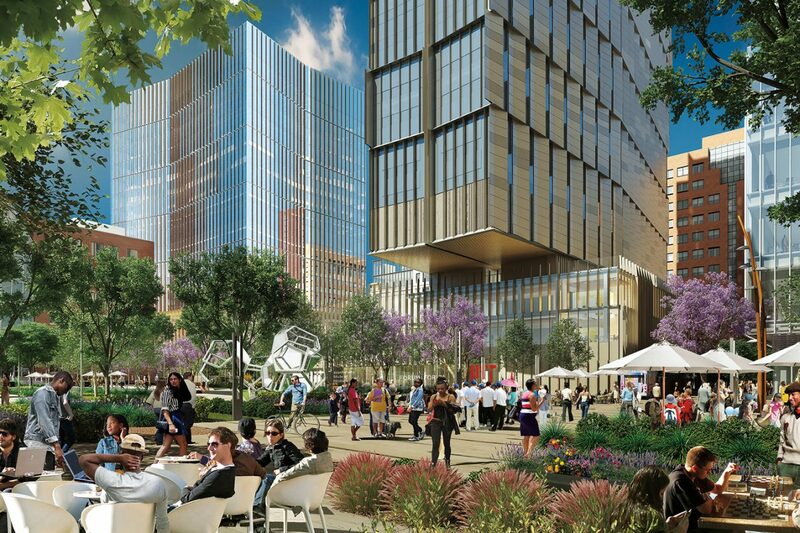 Wow, Kendall Square, with a total makeover!! I remember the days of the F&T (Fox & Tishman) dinner. They were both MIT graduates. They opened a second dinner, a block away, maybe where the firestation, now a hotel is located. Fox & Tishman knew everyone’s name, so when one entered, they would call out your name, and, ask how things were going. They also were very funny!! Would be great to have a plaque where the F&T was located. I agree with the comments about the trees!! MIT has cut down some really incredible trees through the years. MIT cut down 100+ year old tree to build the gym. The city cut down all the trees on Mass Ave in front of 77, to place new piping in the area. Throughout my years working at MIT, I went to city hearing to try to save them, but, was never successful. I painted some of the trees around MIT that are no longer there. I really cheish these paintings, because they remind me of them. Yes, this area should have trees, but, they should only be planted if there is something in writing that they cannot be taken down, unless diseased. For someone who graduated in 1954 in what then was more of an industrial environment with Kendall Square looking more like the mid west, this is truly inspiring. I have been back to MIT many times but the changes during the last 10–15 years have been truly staggering. It’s essential to include affordable housing for families, especially for families supporting the scientists and engineers who aren’t going to be making millions off their inventions. This is a climate adaptation as well as the right thing to do. Also use of green roofs, increasing the tree canopy, bird friendly glass. 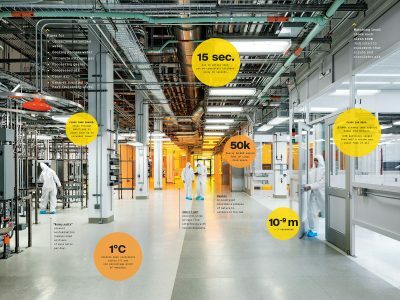 What happened to Project MAC and the Draper Lab?